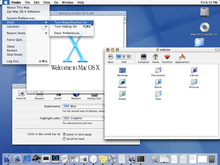 The use of soft edges, translucent colors, and pinstripes, similar to the hardware design of the first iMacs, brought more texture and color to the user interface when compared to what Mac OS 9 and Mac OS X Server 1.0's "Platinum" appearance had offered. According to Siracusa, the introduction of Aqua and its departure from the then conventional look "hit like a ton of bricks." 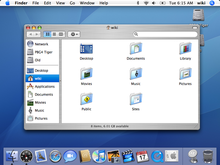 Bruce Tognazzini (who founded the original Apple Human Interface Group) said that the Aqua interface in Mac OS X 10.0 represented a step backwards in usability compared with the original Mac OS interface. 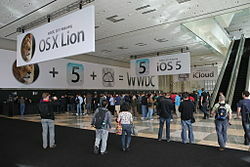 Third-party developers started producing skins for customizable applications and other operating systems which mimicked the Aqua appearance. To some extent, Apple has used the successful transition to this new design as leverage, at various times threatening legal action against people who make or distribute software with an interface the company says is derived from its copyrighted design. ^ Juli Clover (April 22, 2019). "Apple Seeds Third Beta of macOS Mojave 10.14.5 Update to Developers". 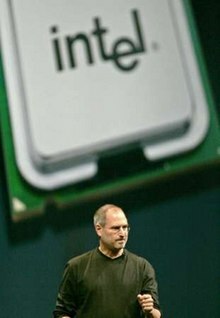 MacRumors. Retrieved April 22, 2019. ^ "macOS Mojave 10.14.5 beta 3 (18F118d) - Releases - Apple Developer". developer.apple.com. April 22, 2019. Retrieved April 22, 2019. This page was last edited on 15 April 2019, at 23:05 (UTC).